As much as I liked War and Peace, I probably got more out of The Wire. And why should that be surprising? More human effort can be put into a television series than a novel and more time is spent consuming it. If both are executed to their highest standards, with equal care, skill and insight, we might well expect less from the book. If we can mention The Wire in the same breath as Tolstoy, then why not another giant of nineteenth century literature, Charles Dickens? Yes, The Wire has been called "Dickensian" too, and this week the Hooded Utilitarian has re-imagined The Wire as a serialized Victorian novel. The premise? 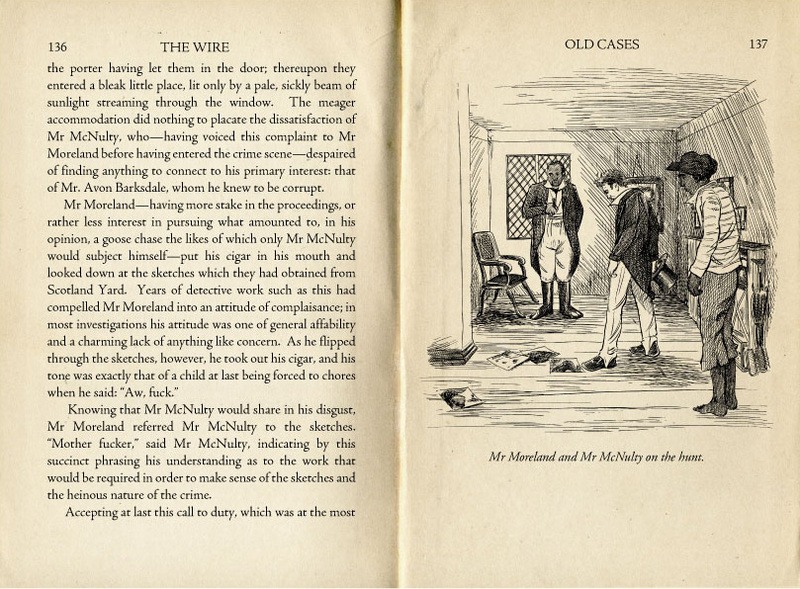 Imagine The Wire written in 60 installments over the course of six years, starting in 1846, by Horatio Bucklesby Ogden, a Dickens contemporary who wrote with a "nuance and attention to detail that Dickens never achieved." Each installment ran 30 pages and sold for one shilling apiece. The Hooded Utilitarian hasn't actually printed these 60 installments (because they don't actually exist). But they have produced a few wonderful mock pages, and written a faux piece of literary criticism to accompany them. A great job by Joy Delyria and Sean Michael Robinson. If it were to be published as a novel I’d read it. I tried watching it but I couldn’t understand half of what was being said (I don’t live in America) so I gave it up as I couldn’t follow what was happening. It seems the drug dealers had a language all of their own. That’s why subtitles exist. My wife is British. We had to stop ten minutes into the first episode and turn them on. She loved it. What would you do if there were a great movie in German, or French, or any other language in which you weren’t fluent? I am Irish and a fluent Emglish speaker and found it a struggle. A Germany friend of mine (who speaks excellent English) watched it with the subtitles on. This is something I would definitely recommend. I am also delighted to see the comparisons with War & Peace, it really is a modern epic and an important piece of art. TV has truly come of age. But its no Anna Karenina!